Trade­-Serve™ is a complete office and field management software that specializes in technical call assistance, sales, and invoice management. Trade Serve aims to help field technicians carry out easy and stress-free appointments while offering the tools needed to help sell further services and appliances. Trade­-Serve™ offers features such as custom package making, surveys, dispatching tools, phone scripting, lead source tracking, third part integrations, and much more. Trade­-Serve focuses on empowering service technicians to present choice to customers. This is accomplished through custom price books, financing packages, Virtual Ride-Along's, and more all on an easy to use interface for employees and management. The whole team is incredible! I can't say enough about these guys and their product. Trade-Serve has transformed the way we conduct business and how we provide our customers with top-notch service. We have increased the sales in our company while increasing the value of what we give our customers. -Jason The price book feature is probably the best thing about this software. It makes bundling packages of products and services VERY simple and quick. 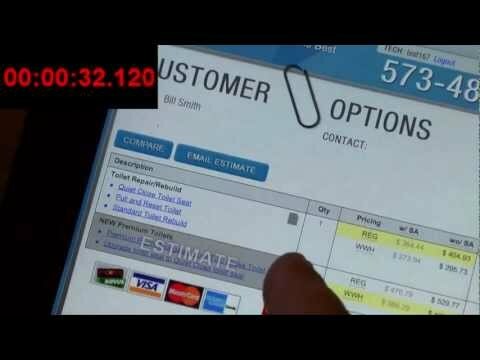 Software is very intuitive and I can use it from any computer, tablet, or even my iPhone! The price book feature is probably the best thing about this software. It makes bundling packages of products and services VERY simple and quick. Software is very intuitive and I can use it from any computer, tablet, or even my iPhone! We have been using this program to run all of our service calls for over 4 years now. We use this software to complete over 5,000 service calls per year and we are completely paperless. Using Ipads, the technician has the ability to access our price guides and select products or bundle products into a package to present to the customer. We have seen a dramatic increase in sales and profits since we started using the software. We have also experienced better inventory control because the technician has to account for the material used right there on the job. I highly recommend this product. Empower service technicians to present beneficial choices to customers. Experience unique user interface benefits such as custom price books, financing packages, and Virtual Ride-Along's. Enjoy a paperpeless and automated system for conducting service calls regardless of industry. Customize a unique customer greeting. Gain cost efficiency with the Invoice Manager. Below are some frequently asked questions for Trade-Serve. Q. What type of pricing plans does Trade-Serve offer? Q. Who are the typical users of Trade-Serve? Q. What languages does Trade-Serve support? Q. Does Trade-Serve support mobile devices? Q. Does Trade-Serve offer an API? No, Trade-Serve does not have an API available. Q. What other apps does Trade-Serve integrate with? Q. What level of support does Trade-Serve offer?